This past week I have been pretty much a hermit, staying at home with the lack of hot water the beginning of the week, only to find that whoever called in the problem said we had some hot water so we were not a priority. So to make that long story short we finally had to have an element replaced and then had to wait 2 hours for a full tank of hot water. That was one welcome shower I tell you. Then we had a winter blast of snow, ice, rain, more snow then wind. Now it is just plain cold. Winter has arrived and Lesley tends to hibernate like a bear. 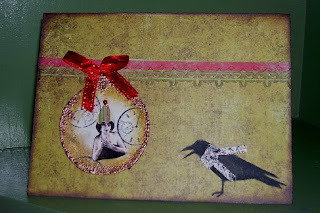 I have come to realize there is only 2 weeks left til Christmas and here I am putzing away still making cards. I thought I would show you a few I have had fun making. My friend Jeanie over at All My Artist Trading Cards sent me an email the last couple days and showed me some pictures of some future swap possibilities. One of them was trees that you can cut and make into any theme, the ones posted in her email were Santa trees. 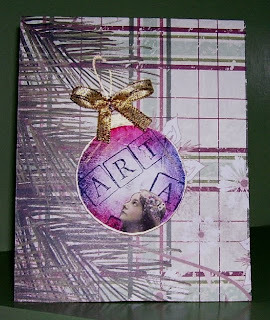 Well I wasn't really up to do any swapping but the tree idea sparked some creativity of my own for come cards. I had some collaged paper on cardboard hanging around waiting for something to be done with it and I applied some white paint over top to tone down the papers, I used mostly text and some scraps of printed papers. Lo and behold it is great to have some saved items for projects like these. I cut 3 different sized trees, stamped them then I took oil pastels and just on the edges of the trees I ran colours, then rubbed with my fingers to just darken the edges and left the centers lighter. I then took a gold gel pen and went around the edge of them, you probably can't see that in the photo. Another option you could emboss with golds, bronzes or whichever colour scheme you are going with. I also made a round ornament, cut a circle usinga shot glass to make it round added the top part, cut it out and voile' you have a round ornie, stamp, do the same but this time I added a vintage girl looking up and the other ornie a vintage lady. 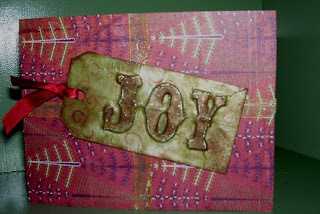 The Joy tag, if you are following Tim Holtz's blog he did this remarkable tag using grungeboard letters, metal sheet, I used metal tape Jeanie sent me a while back then he used alcohol inks to colour. I don't have all the paper accessory luxuries so I just used acrylic paints and did my own thing. This is what I came up with and I quite like it. Now to decide who gets what card, I probably will be a little late getting cards out. I tried to do a bit of decorating today, had to clean up the floor after some furniture got moved for me to put the tree up. Hopefully this weekend JB and I will get ourselves in the Christmas mood after we see the house decorated and snow has finally come. 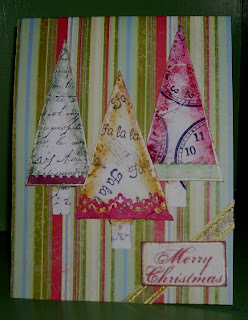 Thank you for looking and I hope I have inspired you to use some of your scraps and make do's for your cards or creations. aww les they are all gorgeous, i loved that embossed metal tape card Tim made , and yours looks fantabulous too. thats what i love about his tutes, you can still do your thing, specially if you dont have all the products. so sorry about the shower.. glad you've got hot water now.. one of the things we soooo miss if we haven't got..
like the cards. Simple but effective. Glad you have the hot water back on, and mmmm... you will have to get through the cold spell. Its great to see I'm not the only one still making Christmas cards so close to Christmas! I came a step closer to sending them today and actually bought some stamps. All these cards are great. The Joy card is just jaw dropping. Really like the tree idea, very good idea for Christmas time as is ornies. May ask you more about making those letters, I like! Oh forgot to mention glad you have water again especially when its cold outside, the absolute worse. Great cards! I was trying to pick a favorite but I can't! They have the niceness of not looking storebought but handmade (rather than homemade if you get my drift). Isn't it a bummer when you find someone didn't get the RIGHT message across and so you sit without hot water, electricity or a telephone?